This past week I was in Cape Town South Africa on a ministry assignment. A colleague took me to the Rhodes Monument. 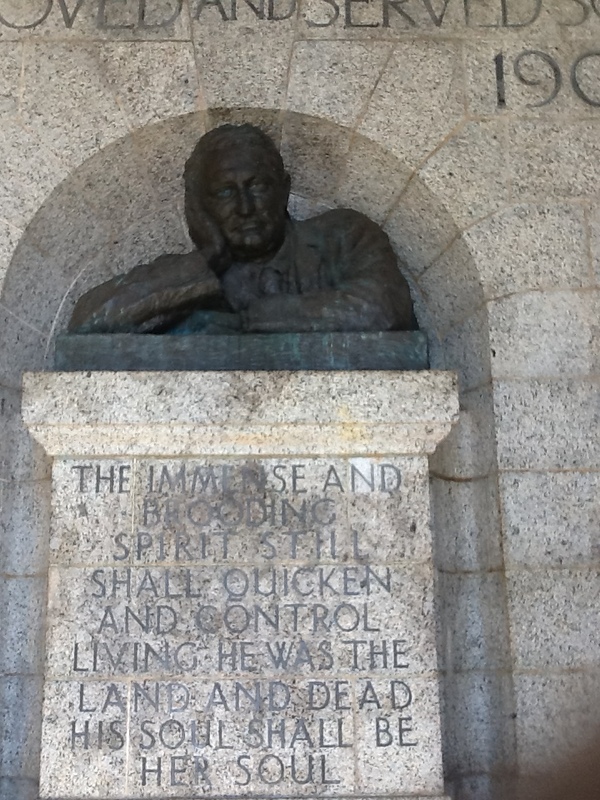 Inspired and challenged by what I saw I decided to take a closer look at the life of Cecil John Rhodes in view of the impact he has had on Zimbabwe and South Africa. I found the following series of 8 documentaries (each about an hour long) on his life done by the BBC on YouTube:– Rhodes: The Life and Legend of Cecil Rhodes. From this intense series I draw some lessons (both positive and negative) for Zimbabwe and our people in general. The life of Rhodes demonstrates the power of vision and the focus to work towards the realization of that vision. His vision of Cape to Cairo was compelling and it drew many people towards it. It is critical whether as a nation or as individuals that we realize that while vision is necessary it is useless unless there is a concerted effort and energy expended in a focused way towards the fulfillment of that dream. Execution is critical to the fulfillment of the dream. I am surprised at how little as a nation we do towards execution of the national vision. We talk more and do less about ZIMASSET and many other economic blueprints. It is time to put our energy where our mouth is and work the blueprints. To finance his dream Rhodes had to work through lots of partnerships and Joint Ventures. It became clear to me that financing a vision requires joint-effort and being open to work together with people who share the vision. In a desperate bid to fulfil his dream Rhodes bribed effortlessly various people within the British government to get what he wanted. This was way back in 1880s-1890s. The lesson I learnt was that unlike what people think corruption and bribery did not originate in Africa but was introduced to Africa. If it is not local then it should be easy for us to get rid of it. I am surprised at our passionate dislike of colonialism but our desperate holding onto some of the things which came through colonialism like corruption. I am tempted to think that corruption and bribery was introduced into independent Zimbabwe by others. So part of the national economic liberation should include a concerted effort to fight corruption and bribery. For Rhodes’ dream to come to pass he used his friend Dr Jameson to pretend to treat Lobengula of gout by addicting him to morphine so as to compromise him. Here is a telling story that Lobengula tells Dr Jameson while being injected with morphine. A crocodile opens its mouth and lies still while flies play around its tongue. It remains motionless while its sets the trap for the unsuspecting flies. At a moment when the fly least expects it, the crocodile snaps its mouth shut and the fly becomes food. Lobengula then states that he has this suspicion that the White man is the crocodile which is laying a trap for the unsuspecting Ndebele. The lesson I learnt was that in politics and in business not everyone who comes as a friend is well meaning. Beware of Dr Jamesons in your life. The trained healers who turn killers! The birth of Rhodesia (now Zimbabwe) was based on greed and lawless dispossession of the natives in pursuit of Rhodes’ dream. I have often wondered whether that spirit of greed that dispossesses the weak and vulnerable has really been exorcised from the national conscience. The level at which some leaders will cover their greed with the cloak of righteousness while they dispossess the innocent seems to indicate that spiritually this issue has to be dealt with if we as a nation are to make progress. From the documentary it is clear that Rhodes viewed the mineral wealth of Zimbabwe as being able to finance his dream of Cape to Cairo in an expansion of the Empire. Another documentary on the Great Zimbabwe that I saw alluded to the fact that the Great Zimbabwe was really a commercial capital whose primary purpose was to fund the expansion of the Empire. I then wonder whether its incidental that the greatest challenge on Zimbabwe is a constraining of its economy. Could this be an indication of the devil fighting the divine destiny of Zimbabwe as a Kingdom-financing nation? Rhodes was passionate about possessing land. I realized that land is a powerful store of wealth. It is important to own real estate. Whoever controls land controls the economy. Who controls your own economy?